Analysts at Bernstein are out with a report this morning upgrading shares of SolarCity Corporation (SCTY) with an ‘Outperform’ from ‘Market Perform’ rating as the Congress passed a solar tax credit bill yesterday. 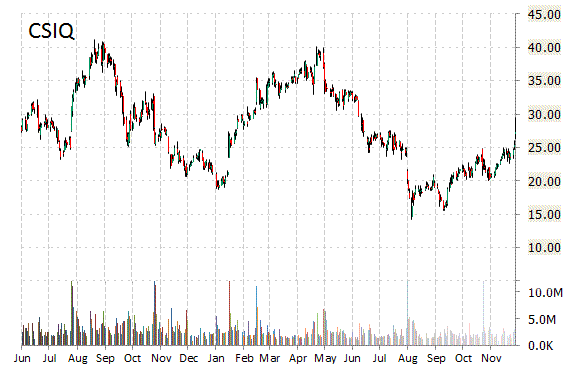 Bernstein set its price target for the company at $69. In the past 52 weeks, shares of San Mateo, California-based company have traded between a low of $24.07 and a high of $63.79 and are now at $57.30. Shares are up 7.88% year-over-year. The chart below shows where the equity has traded over the last 52 weeks. Analysts at Deutsche Bank (DB) upgraded their rating on the shares of AGCO Corporation (AGCO). In a research note published on Thursday, the firm lifted the name with a ‘Hold’ from ‘Sell’ rating and set a 12-month base case estimate of $46 from $40 per share. On valuation measures, AGCO Corp. shares are currently priced at 14.02x this year’s forecasted earnings, compared to the industry’s 17.08x earnings multiple. Ticker has a price/sales and P/E ratio of 17.72 and 0.49, respectively. EPS is $3.18. 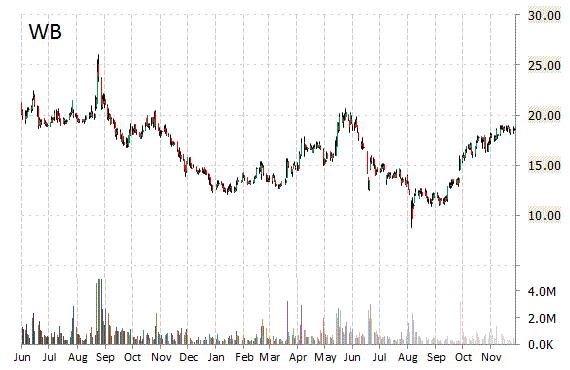 Currently there are no analysts that rate AGCO a ‘Buy’, 14 rate it a ‘Hold’ versus 2 rating it a ‘Sell’. AGCO has a median Wall Street price target of $46 with a high target of $55. Weibo Corporation (WB) was raised to ‘Overweight’ from ‘Equal-Weight’ at Morgan Stanley (MS) on Thursday. WB is up $0.67 at $19.57 on heavy volume. Midway through trading Thursday, 1.54 million shares of Weibo Corp. ADR have exchanged hands as compared to its average daily volume of 533K shares. 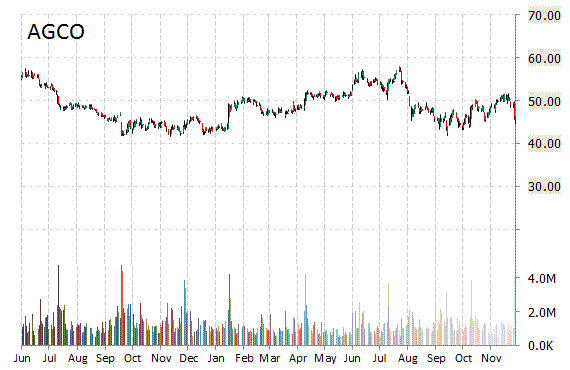 The stock has ranged in a price between $19.00 to $19.98 after having opened the day at $19. Pandora Media, Inc. (P) was upgraded to ‘Market Perform’ from ‘Underperform’ by FBR Capital analysts on Thursday. The name was also raised to $18 from $14 at MKM Partners following Copyright Royalty Board decision. P is currently printing a massive average daily trading volume with the issue trading 30 million shares, compared to the average volume of 7.11 million. The stock began trading this morning at $15.90 to currently trade 13.69% higher from the prior days close of $13.44. 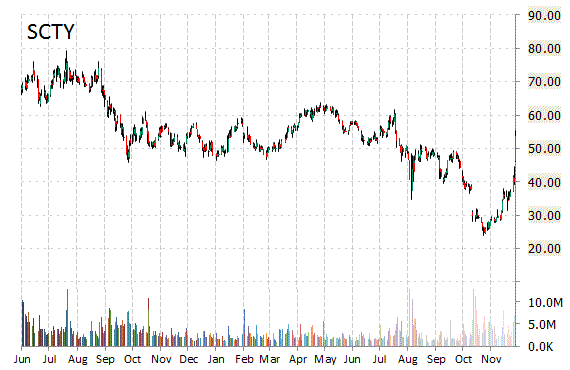 On an intraday basis it has gotten as low as $12.86 and as high as $16.23. Canadian Solar Inc. (CSIQ) was reiterated a ‘Buy’ by Canaccord Genuity analysts on Thursday. The broker also raised its price target on the stock to $35 from $29. 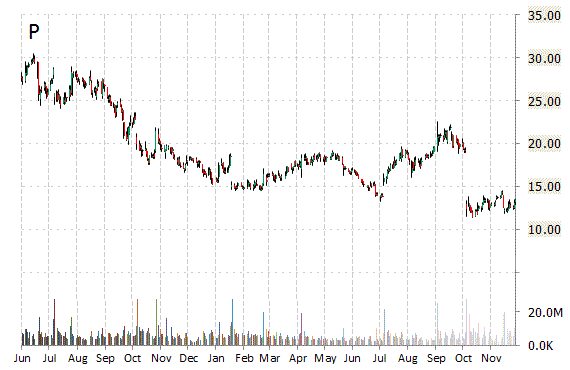 CSIQ recently lost $0.71 to $26.57. The stock is up 23.89% year-over-year and has gained roughly 13% year-to-date. In the past 52 weeks, shares of the manufacturer of solar wafers have traded between a low of $14.16 and a high of $40.08. Canadian Solar Inc. closed Wednesday at $27.28. The name has a total market cap of $1.49 billion.